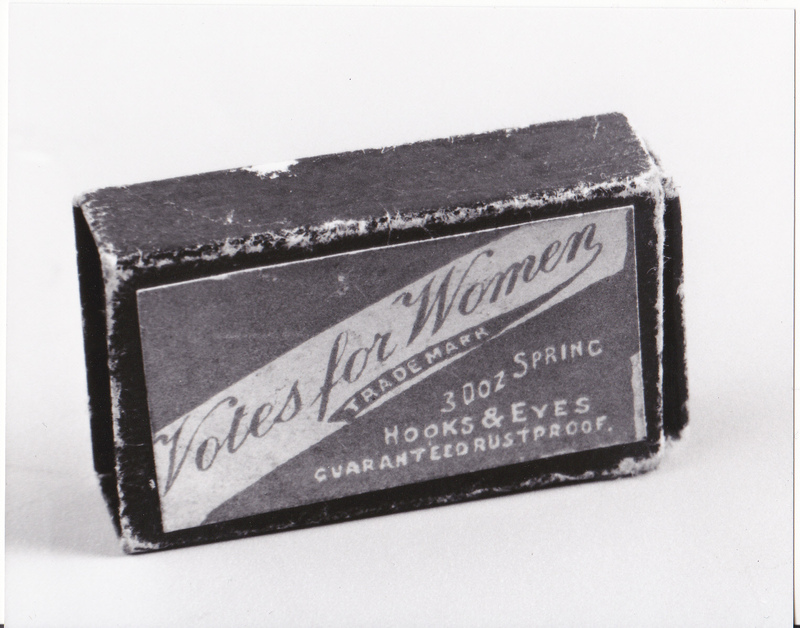 In over 30 years spent hunting for and selling objects related to the women’s suffrage campaign, this little box is the only example I have ever found of ‘Votes for Women’ Hooks and Eyes. Although I had it photographed in black and white back in the 1990s, the box in reality is tricked out in the WSPU colours of purple, white and green. These items might well have been found amongst the stock of the suffrage shops opened by the various suffrage societies. As well as being campaigners, the majority of suffragettes and suffragists were, of necessity, also needlewomen. So here was an opportunity to back the Cause while sewing fastenings onto their skirt plackets or bodices. This entry was posted on January 16, 2015, 1:31 pm and is filed under Collecting Suffrage. You can follow any responses to this entry through RSS 2.0. You can leave a response, or trackback from your own site.